I’d never come across Dulcét (note the accent over the e) prior to stepping into the Business Class lounge at Auckland International airport in July and ordering a glass of bubbles to sooth my nerves as well as amping up the excitement before getting on the plane. Dulcet means sweet and smooth according to the first definition that Google delivers. And this newly discovered New Zealand offering is indeed sweet but not in the sugary sense of sweet because the wine tastes dry in that scheme of things. To me it’s sweet in the cool, hip, sweet bro sense. Dulcet also means soothing, mellow, pleasant, agreeable, harmonious so a fitting name for this method traditionelle that’s described on the back label as ‘the many sounds of celebration’. Dulcét Methode Traditionelle 2013 is from Marlborough and a Blanc de noir style, so made from black grapes only – pinot noir and perhaps a little pinot meunier. Whatever, I love it. It’s full of lively bubbles that dance on the tongue, aromas and flavours that make me think of bread baking in the oven, there’s a delicious cream nutty complexity and a long lingering finish with refreshing citrus brightness. I order a second glass. 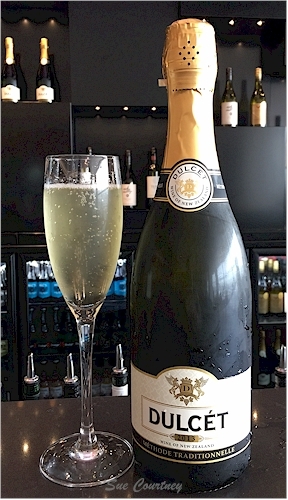 This entry was posted in #nzwine, bubbles, marlborough and tagged 2013, Blanc de Noir by Sue Courtney. Bookmark the permalink.